In the Main Inventory window click Display Each Tool. Click on the Labels box and select New Labels. 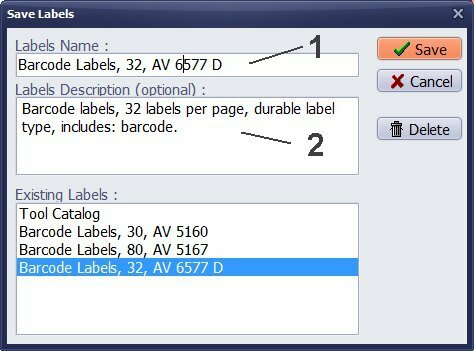 Select data fields that will be included on the label. 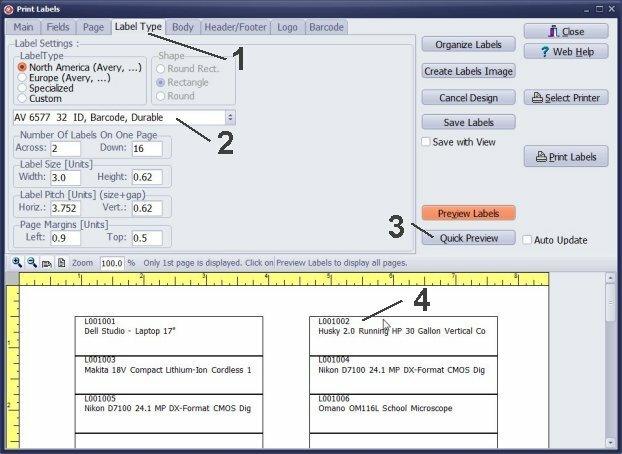 The Print Labels window always starts with 3 preselected data fields. Usually you will unselect them. Click on the field in the Included Fields box to select the field. Click Red Arrow icon to remove the field. Remove ID and IDNO fields from the Included Fields box. 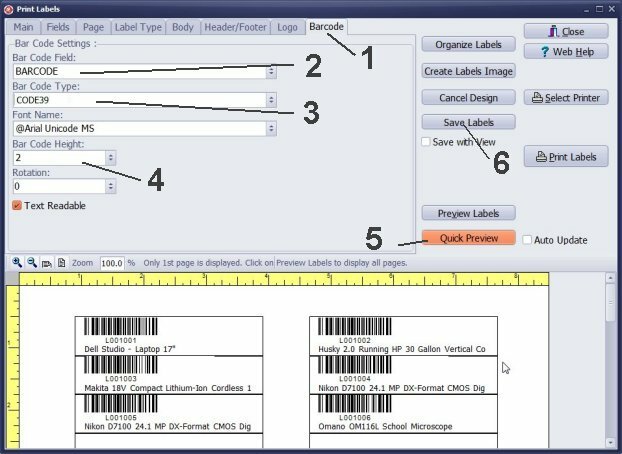 In this sample we want to create a label that includes a barcode and a tool/equipment name. Scroll down in the All Fields box, find ITEM_NAME field, then click ITEM_NAME to select it. Click the Green Arrow icon to include the ITEM_NAME in the Included Fields box. Click the Label Type tab. Click on the Label Type box, scroll down, select "AV 6577 32 ID, Barcode, Durable". Click Quick Preview to verify the label type selected. 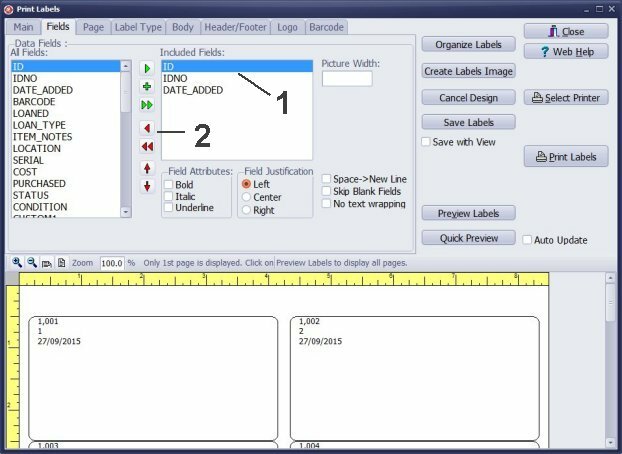 The quick preview displays BARCODE field in the text form. 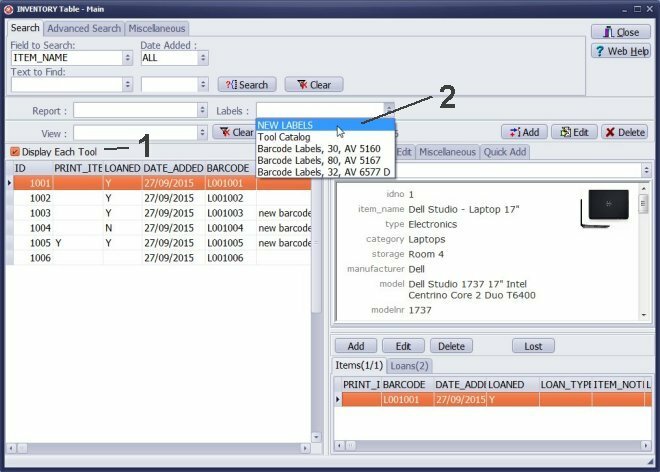 Select BARCODE in the Bar Code Field box. Select CODE39 in the Bar Code Type box. This barcode type is very popular for inventory check in/out applications. It can be decoded by virtually any barcode scanner/reader. The barcode is also self-checking. Click Save Labels to save the label design for the future use. Save label design for the future use. Enter name into the Labels Name box. Enter label description into the Labels Description box. 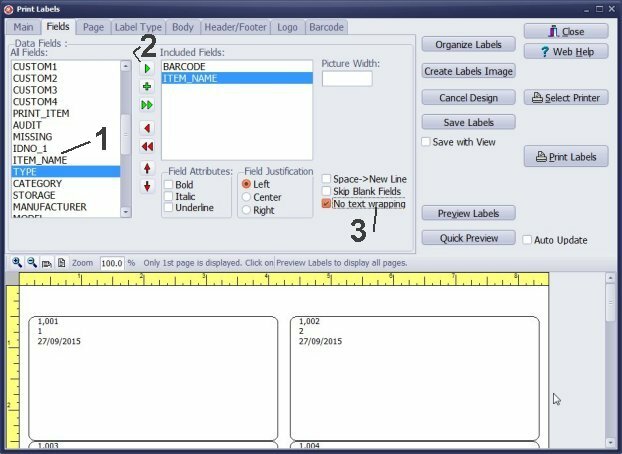 In the Print Labels window click Preview All. Use arrow icons to verify labels. Check the number of pages. Click Print icon to print. Click Close icon to close the Report Preview window. How to create a report image for the predefined template. Use Magnifying Glass icon to set the report preview size. Try to scale to 30% of the regular size. 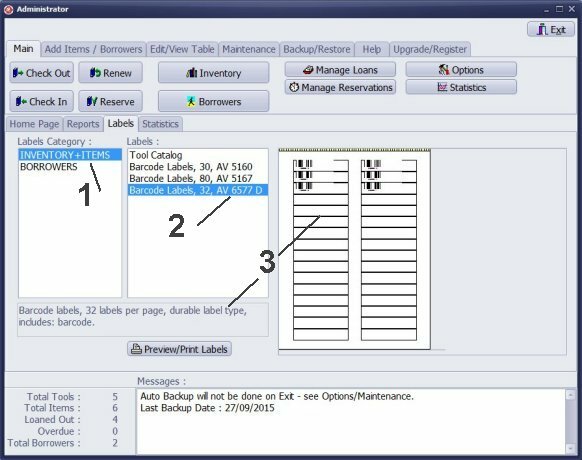 All saved reports and labels you can find on the Reports and Labels tabs. On the Label tab, in the Labels Category, click INVENTORY + ITEMS. In the Labels list click on the predefined label report. The selected label report displays the report description and preview . 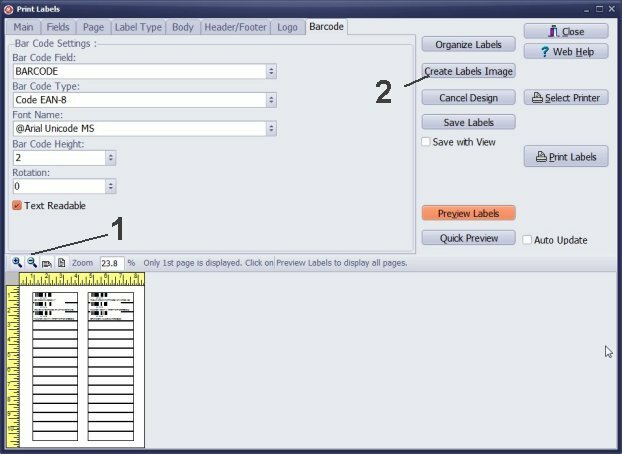 Double click on the label name or click Preview/Print Labels to run the report. Note: predefined reports/labels allow you to save a view (advanced search definition) in the report definition. The view is always executed when the report is run from the Handy Equipment/Tool Administrator window. If the report definition does not include any view, then all records will be used in the report.